The Department of Physics organised a general awareness programme on Science – ‘The World of Science – 2018’ on 8th November, 2018 in the atrium of Academic Block II of Tapesia Campus where a number of scientific models were demonstrated. The programme showcased various scientific applications which a lay person does not understand at first glance. 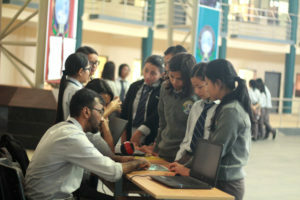 Students of the Department of Physics set up various stalls where they explained to visitors, the applications involved in vacuum cleaner, how we see colours, atmospheric pressure, gravitational waves, lever, etc. The working models demonstrated and simplified the complicated principles of science behind the objects and activities of our day to day life. The awareness programme was conducted to mark the 151th birth anniversary of Marie Curie (who was born on 7th November 1867). The second round of the programme was conducted at the neighbouring schools with an aim to eradicate the fear of taking up higher education in Science and also to sow and induce an interest to study Science among students in High School. The faculty member in charge of the programme, Dr. Ngangom Aomoa, expressed his satisfaction over the impressive participation from two Science Clubs of the Department – Physik and Astronomy and also over the visitors and their expressed appreciation. 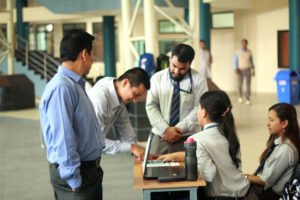 Dr. Samrat Dey, Head, Physics Department said that these science popularisation programmes will be a regular activity of the department of Physics.